Grab a bite to eat at the Café du Cours, a snack bar at the Hôtel du Nord. The Café du Cours offers the opportunity to stop by for some refreshments and to satisfy those hunger pangs. Come and enjoy a good time with your loved ones. We have a sushi bar, but also an ice-cream menu and a tea house where you will be able to try our Dammann Tea or Kusmi Tea. Our snack-bar is the favourite place for many locals, tourists and holidaymakers from all over (Ajaccio, Bastia, L’ Île-Rousse…). 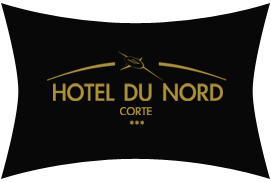 Located in the centre of Corsica, the Hôtel du Nord has built a fantastic reputation throughout the region. The snack bar is not exclusively reserved for hotel guests. If you are only passing by, come have a drink, eat an ice cream or have some sushi … according to your desires and tastes! You will be seduced by the setting and location of the Hôtel du Nord. Remember to book for your future holidays in Corsica. We have comfortable rooms. The hotel is located in the city centre and has a secure car park. Please do not hesitate to contact us should you have any questions!